Mix together the pork mince, grated apples, spring onions, dried sage and garlic granules, season with salt and pepper, mix well and form into 4 burgers. Mix the mayonnaise, apple sauce and parsley together. Grill or BBQ the burgers for about 5-7 minutes on each side. Split the rolls and toast on the cut side. 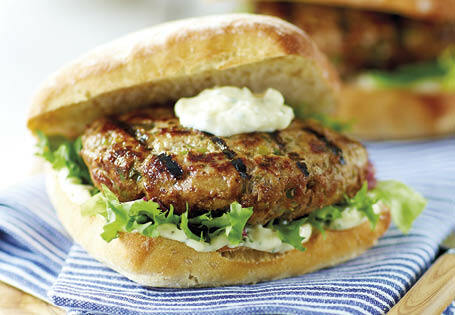 Layer the burger on the rolls on a bed of lettuce and apple mayonnaise and serve.